WASHINGTON--(BUSINESS WIRE)--Trump International Hotel® Washington, D.C. announced today that it has been awarded by TripAdvisor®, the world's largest travel site, two Travelers’ Choice Awards, ranking it #4 of Top Luxury Hotels in the United States and #7 of all hotels in the United States. Travelers' Choice award winners were determined based on the millions of reviews and opinions collected in a single year from TripAdvisor travelers worldwide. “Since the moment we opened our doors, Trump International Hotel has quickly proved itself to be one of the finest hotels anywhere in the world. We have the best location, an absolutely unrivaled product and most importantly an incredible team,” said Eric Trump, Executive Vice President of the Trump Organization. Adding to the prestige, in October Trump Washington, D.C. was also named by Forbes Travel Guide Verified List as one of the 2018 World’s Most Luxurious Hotels, one of only 58 hotels in the world across 17 countries. This came months after the hotel achieved its Forbes Five Star designation after only one full year of operation, a true testament to the extraordinary service delivered by this team. 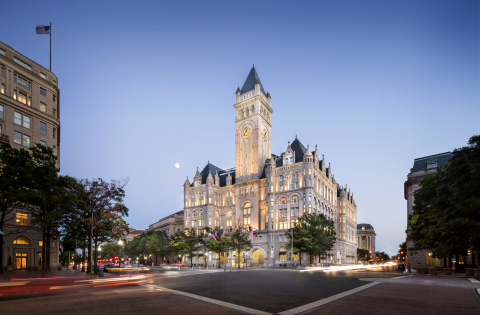 About Trump® International Hotel, Washington, D.C.
Washington’s historic Old Post Office has been restored beyond its initial grandeur and proudly stands as the iconic, five-star Trump® International Hotel Washington, D.C., bringing a new level of luxury to Pennsylvania Avenue. The richly luxurious guest rooms and suites, among the largest in Washington, D.C., feature lofty 16-foot ceilings, soaring windows, beautifully restored historic millwork, and glittering crystal sconces and chandeliers. The thirty-five suites include the Trump Townhouse with its private entrance on Pennsylvania Avenue. At 6,300 square feet of interior space, it is the largest and most luxurious suite in Washington, D.C. and among the largest in the country. The hotel also offers a total of 38,000 square feet of meeting and event space, including the opulent 13,200-square-foot Presidential Ballroom, the largest among D.C. luxury hotels, a 10,000-square-foot Spa and Fitness Center, D.C.’s first BLT Prime restaurant by Chef David Burke and the country’s second location of Sushi Nakazawa by Chef Daisuke Nakazawa. For more information, visit www.trumphotels.com/washington-dc. Connect with us on Facebook, Twitter and Instagram. Trump Hotels™ is a brand of five-star luxury hotels and resorts with a mission of providing extraordinary customer experiences and luxury accommodations. Its exceptionally designed hotels in iconic locations put guests at the heart of each destination. Each property provides a variety of offerings including signature programs designed with the guest in mind, and every hotel has a distinct design that is culturally-relevant, with iconic architecture that is contextual to the destination. The brand’s “Never Settle” philosophy permeates its everyday work culture, with dedicated leaders and talented associates priding themselves on impacting the guest experience with exacting standards and keen attention to detail.